The best Japanese takeaway listings in UK. Read customer reviews, check out the menu online, order food online from you local Japanese takeaway restaurant and it delivered to you at home within minutes (usually the delivery takes up to one hour and might not be free, but please check before you order with each individual takeaway). 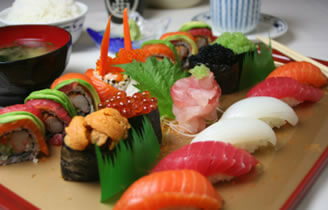 Click on the links below to view the menu and order online from any of these Japanese takeaways. For more choice and your local takeaways, please use the search box provided at the top of this page. Some of the popular Japanese dishes like sushi, dim sum, sashimi, maki, wasabi and more available to order online and delivered to your home for free (minimum order value may apply).